A few weeks ago I did a reading for a mother who had lost her son in a tragic accident. He had been on his way home after a night out with friends; swerving to avoid hitting wildlife on the highway, he accidently rolled his car. His broken body was found outside the vehicle and he was pronounced dead at the scene. Needless to say, losing her son has been the most difficult thing she has ever had to deal with. Like so many of my clients, this mother could hardly bare the thought of her son dying alone. She was seeking answers as to what happened in the final moments of his death. Her hope was that perhaps it would make it easier for her to find peace and acceptance and ease her grief. When someone close to us dies, we go numb, we are in shock and have periods of disbelief. 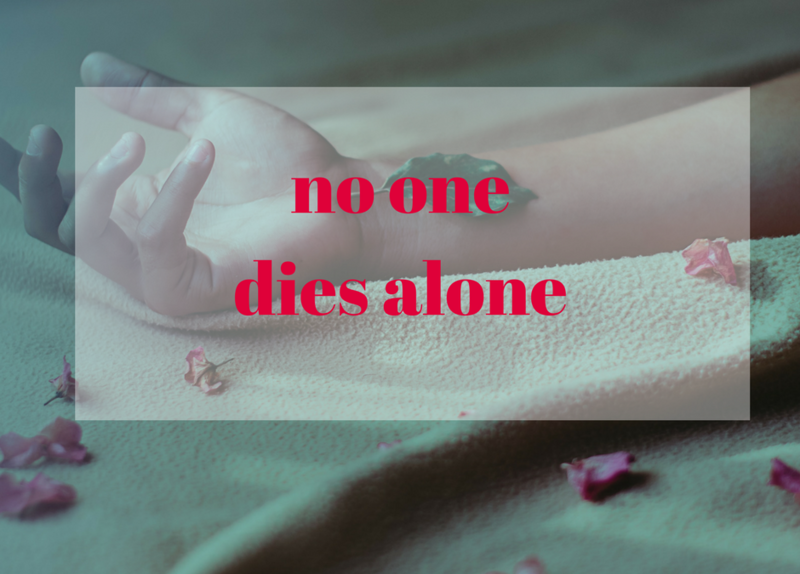 Whether a death is a result of an unexpected accident, a traumatic event like murder, suicide, a sudden heart attack or a terminal illness, the thought of someone that we love being alone at the time of their death consumes us with guilt and paralyzes us in our grief. What happened in his final moments? Was there anyone there to meet him? After all the hundreds of connections and conversations I have had with Spirit over the years about their death experience, I can guarantee you that no one dies alone. Someone who is in the process of dying is always greeted by loved ones on the other side; God calls them ahead of time to be there. Loved ones in Spirit stand waiting and ready to support. Grandparents, parents, children, spouses, pets, friends, ancestors, spirit guides and angels all gather together to welcome a Soul home. It is one of the holiest of celebrations. Great reunions take place as soon as they leave their physical body. There may be a moment of shock as a person realizes they have died and yet, in that very same moment they are met with reassuring love. In an instant, all pain, disease and suffering is completely eliminated as they make transition into Heaven and they are more than okay! They are immediately surrounded, loved and cared for, helped and supported. God welcomes everyone and opens the gates of Heaven to all those who choose it. There is nothing to fear, to be worried about or concerned of. The large majority of Spirits cross over immediately or very shortly after their death. In fact, there have been many times that Spirit has shown me that they were actually pulled out of their body the moment before the impact occurred in an accident. In cases of Alzheimer’s or dementia or even a lengthy process of dying, they were in and out of their body and/or already in reunion on the other side when their death occurred. In every single one of these incidents, no matter how they died, Spirit assured that they did not suffer, nor did they feel any pain or have any difficulty at all. Their message is that they are happy, at peace and well and want the same for us too. Over the years, Spirit has loving shared the same message, “Do not feel bad because you were not there when I died”. Very often they state that they did not want their family or a certain person with them, not because they did not love them, but because they loved them so much that it was their way of protecting their memories for them. They wanted to be remembered for how they lived and not how they died. May it bring peace to your heart and mind to know, just like it did for my client, that someone special was there with your loved one and they were not alone – they were lovingly helped to the other side.